Simple, Customizable and Secure. For the aforesaid reasons, among all the emerging technologies, IoT is projected to have the greatest impact on the industrial economy. People love IoT in a box for numerous reasons like higher productivity, increased quality, enterprise scalability, more data etc. 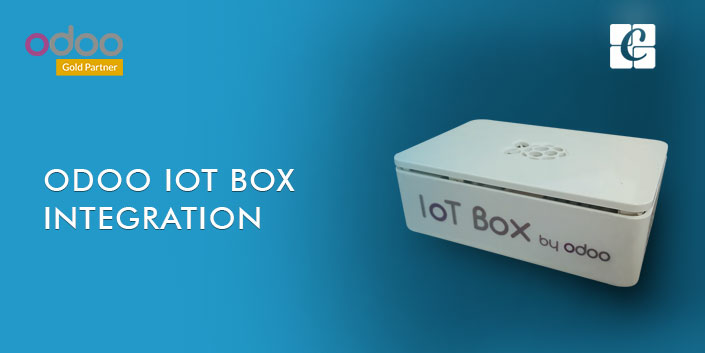 Today IoT box acts as a prominent choice for smooth conduction of business operations in all industry profiles. IoT or Internet of Things refers to the ever-growing network of physical objects that feature an IP address for internet connectivity. A communication is followingly triggered between these objects and other Internet-enabled devices and systems. a) IoT as technology, it enables smart devices to get connected together, communicating with each other in a fast and significant manner. b) It helps in being abreast to changes happening in the environment. c) It helps to take swift actions with respect to new changes or actions. a) As IoT being a network of machines, it has the least chance to get mistaken. b) IoT devices are as accurate as they are programmed. c) IoT devices enable users to take the most accurate measurements. a) IoT devices, as they are connected to a network or a system, they can make requests or trigger actions within its host. b) IoT devices measure changes in the environment. c) IoT devices can take automated actions. a) IoT generates a lot of data, More data means more information and more information means more accurate results. The Odoo IoT Box is a small raspberry pi based device that comes completely integrated with Odoo. 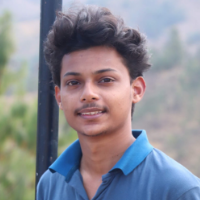 It enables Odoo in getting connected to a different type of external devices like printers, cameras, scanners, foot switch, caliper and more. And the devices in the Devices Menu. Since IoT Box enables fast operations and automation, the time taken for a particular process is significantly reduced to low. Secondly, when the devices are used for inputs, the encoding mistakes become the least. Since the IoT Box contributes to automating the work, the workload gets reduced like never before. 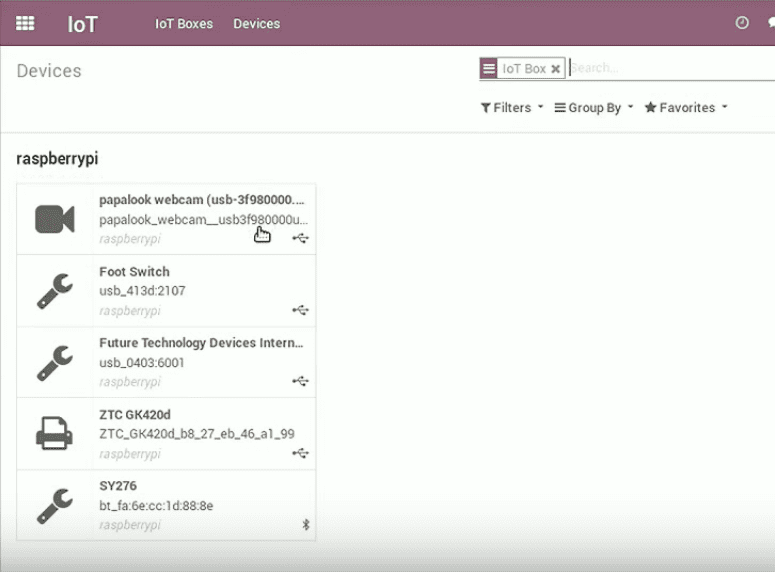 Odoo made the IoT Box configuration least technical. It enables any raw user to easily configure it. It acts as simple as configuring a home theatre or a TV. 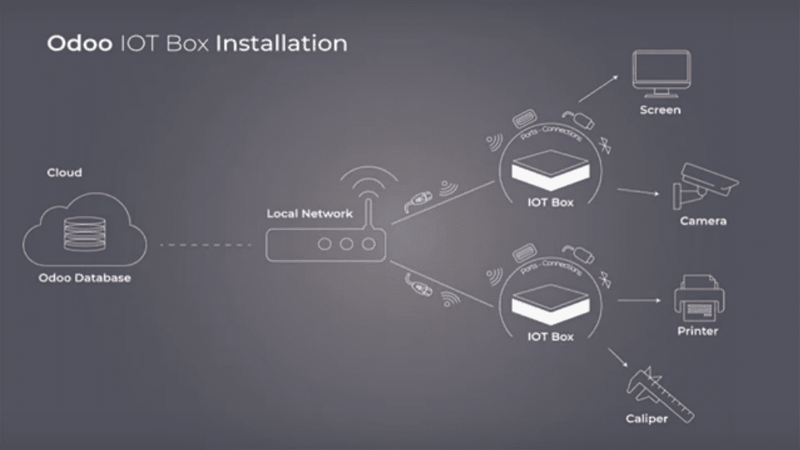 As Odoo has introduced the IoT Box app, it becomes the easiest and seamless option to conduct. Hope the article gave an insight to IoT Box and Odoo’s functional vicinity with respect to same.